The Bharatiya Janata Party manifesto, in which it reiterated its commitment to repeal Article 370, conferring special status on Jammu and Kashmir, and annul Article 35A, has set off a storm in the border state. Peoples Democratic Party leader Mehbooba Mufti, who was chief minister till recently in alliance with the BJP, lashed out at the announcement, warning that if it was done, both Kashmir and India 'will burn'. 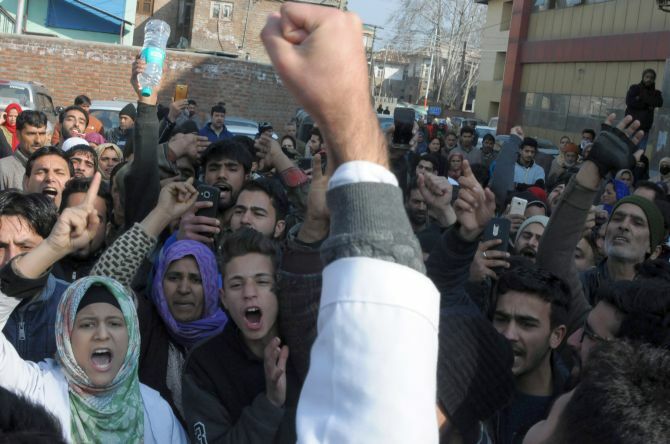 Shah Faesal, the 2010 batch UPSC topper, resigned from the Indian Administrative Service in January to protest against the violence in Kashmir and launched a new political party, the Jammu and Kashmir People's Movement. "There is an atmosphere of freeze in the valley. 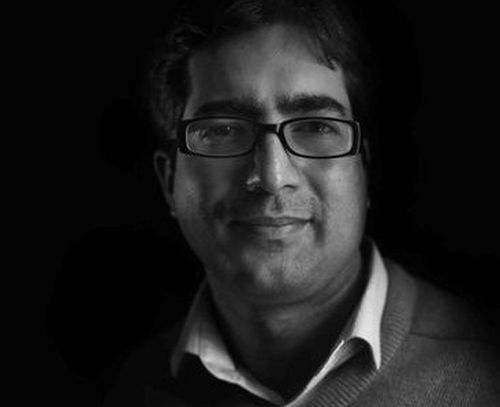 I just hope something good happens after the election," Faesal, below, tells Rediff.com's Syed Firdaus Ashraf. The BJP has said in its Lok Sabha election manifesto that it will repeal Articles 370 and 35A. The BJP has been talking of abrogating Article 370 for the last 70 years. The BJP has nothing else to show. Even if they do it (repeal Article 370), that would be wrong as this matter is sub-judice. It would be contempt of court. Article 370 is a bridge between the Union of India and the people of J-K.
We have said if the BJP abrogates Article 370, then as a mark of protest we will move our watch 15 minutes away from Indian Standard Time. But what has Kashmir achieved with Article 370 as businesses from outside the state can't settle there? Don't you think Article 370 is bad for Jammu and Kashmir? Article 370 has got nothing to do with outside people not coming to J-K. Article 370 is like laws are in other states. We in Kashmir are ready to lease our land for 90 years to business people. I feel people must respect the promise of the prime minister of India (Jawaharlal Nehru) to the people of J-K.
That promise needs to be respected. Let us talk about development. It is wrong to say that Article 370 is the obstruction. It is the only bridge which connects the people of J-K to the people of India. Don't you think the trust between Jammu and Kashmir and the Union of India has already broken, even without the abrogation of Article 370? It is because Article 370 is more of a hollow. Its essence has been eroded. The kind of federalism, which was envisaged earlier, that is not in action. We have been seeing constant erosion of institutions. J-K was expected to be a very unique state in the country where only three subjects matter: Communication, defence and external affairs, which would be managed by the Union of India. It was a very unique federal arrangement, but it did not work and the people of J-K are not to be blamed for that. It is the Union of India which has not been able to keep up its promise. Prime Minister Narendra Damodardas Modi has been criticising National Conference leader Omar Abdullah over his reported statement seeking a separate prime minister for Kashmir. This concept went on till 20 years after Independence (Ghulam Mohammad Sadiq was the last prime minister of Kashmir in 1965 after which the postion was changed to chief minister). So when the people of J-K say they want their prime minister, they are saying what the Constitution of India says. Today some parties have reservations on this thought. But if you go by the essence of the Constitution of India, I don't see any problem in having a separate PM for J-K. There is an audio clip of the Hizbul Mujahideen doing the rounds of social media describing your entry into mainstream politics as an 'Indian camouflage to entrap Kashmiri voters'. There has been a perception in J-K about politics as a lot of experimentation has been done in the past. I don't mind what is being said about me. I am clear about what I am doing and I will not mind whatever is being said about me. I believe we need to revive the relationship between the people of India and people of J-K.
Coming to the traffic ban, why did you challenge it in court? Don't you think the safety of the security forces is essential post the Pulwama attack? In our writ petition, we have categorically stated that the security personnel have the right to safe movement. We respect their right to life. We believe that while making arrangements for their safe movement, the right to movement of indigenous people should not be infringed upon. It is not that the state government did not have alternatives. It is not that the security forces have not moved from Jammu and Kashmir or vice versa for the last 30 years. It is not that elections have not been held before. But this is an unprecedented step taken. We believe it has been taken without considering the impact that it would have on the lives of ordinary people. This highway is the only link which connects the Kashmir valley to the rest of the world. What were the difficulties faced since this blockage started last week? There is a blanket ban on civilian traffic. This highway is the only connectivity between north and south Kashmir. This is also the only connectivity between Kashmir-Ladakh and the rest of the world. Now they say school buses are allowed. But you have to understand only private schools have buses. Government schools don't have buses. Even if you allow buses of private schools (to ply), what about teachers? How will teachers travel as they travel by private transport? Patients have to go to hospitals in case of an emergency. But they cannot go as the highway is shut. They need permissions to go to hospital. Does it mean that patients should first go to district authorities for permission and then go to hospital? At checkpoints there are no doctors. So how do you certify a patient at checkpoints? Since the highway is closed on Wednesday, government employees are not able to travel. So do you want Wednesday to be declared as a state holiday? What happened to traders who use the national highway? So there are serious issues in implementing this order. Are there any alternatives to the blockade? On Sunday, the highway was closed and traffic was not allowed. But even on Monday, there was (army) convoy movement. So how can convoys be safe on Monday? You can travel very early in the morning or have more security forces for the convoy. There is another option, of the train. Forces can travel by train from Qazigund to Baramulla. We have said dedicate this train to security forces. Let them use this as we will have roads free for others. We also said that allow traffic movement during night. Some midway has to be found. 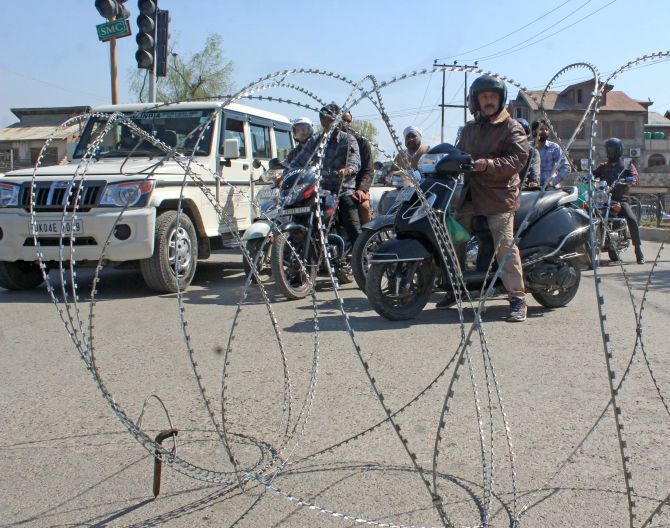 IMAGE: The Jammu-Srinagar national highway with barbed wires placed on it to prevent movement. What will happen if accidentally some civilian cars travel on the highway on Wednesdays or Sundays? People are being bullied and beaten up if you try to approach military convoys. Security-wise, I feel this arrangement of army movement is more vulnerable. If anybody has to attack an army convoy, he knows he has to attack on Wednesday or Sunday. So I don't know what kind of logic has been put into this order. Did you try to speak to Governor Satya Pal Malik or the army authorities? We have filed a PIL in court. We have come across a report that even the Indian Army is not happy with this arrangement. It was implemented without their knowledge. There is a lot of chaos on the streets and confusion in the civil secretariat. We have filed the PIL and the honourable court is deciding the matter. So it would be unfair for me to comment beyond that. After the terrorist attack in Pulwama in which over 40 Central Reserve Police Force jawans were killed, how has the situation been in Kashmir? The life of ordinary people in Kashmir has become miserable post the Pulwama attack. We have seen unprecedented restrictions of Kashmiris on the national highways post the Pulwama attack. It is very hard to travel now. Earlier, if it used to take 1 hour for a journey pre-Pulwama attack, it now takes 4 hours because of security arrangements. Things have become very bad. There is an atmosphere of freeze in the valley. I just hope something good happens after the election.